The ACE was a significant machine running inspired software, but it struggled to compete in a marketplace increasingly dominated by home users wanting to play games with colour and sound. The monochrome display, tiny beeper and unfamiliar language all combined to limit its popular appeal, and very soon the ACE was in financial trouble. Jupiter Cantab Ltd, the short-lived company set up by Vickers and Altwasser to produce the machine, ceased trading during the autumn of 1983 and was in liquidation by November. At a meeting on 6th February 1984 with Dennis Cross, the appointed Liquidator of Jupiter Cantab, it was agreed that Boldfield Computing would make a staged purchase of all the assets and stock, starting two weeks later on 21st February. Mail Order sales commenced straightaway, with Boldfield Computing working quickly to add the missing software and accessories that would make the ACE viable as a machine for enthusiasts. A full brochure of products was launched during the summer of ’84, and a dedicated Jupiter ACE showroom opened in Cambridge later the same year. With the ACE now successfully selling to a niche market, and having bought up all the known stockpiles in Britain, Boldfield scoured the European outlets too, bringing back more ACEs and converting them to the UK standard. 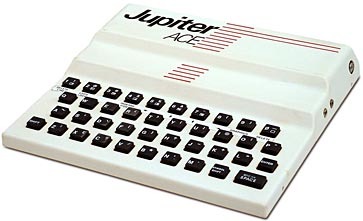 Boldfield Computing’s commitment and support for the product was maintained well into 1986 – allowing the Jupiter ACE to outlast its rivals with dignity, and be assured its place in history. The original Boldfield directors retained the Jupiter ACE project, along with a treasure trove of its historic artifacts, and now on the 30th anniversary of them taking over the reins, they decided the time has come to pass on this iconic brand, and this fascinating collection, to a new owner. This unique collection not only represents everything “Jupiter ACE”, but is also a full set of brilliant examples of their genre – from that epic era when a generation of computers was built in bedrooms, quality control was a cardboard box where the working tapes were kept, and for a lucky few, a 10p cassette would earn them a fortune.